Pine Point's Parents' Association offers support and enrichment of the entire program. Parents have many opportunities to be involved in the life of the school. We begin the year with an all-school family picnic. 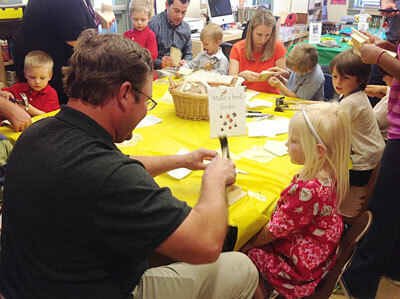 Each grade level sponsors a family social that serves to strengthen the bonds of the class. Every September, we host our Back-to-School Night in which parents visit the classes and meet with the teachers to learn about the exciting program planned for the year. Class Coordinators in each grade help to support the efforts of the teachers and provide enrichment activities for their respective classrooms - from special hot lunches to playground trips. The Parents' Association meets throughout the year, seeking ways to enhance parent education and to support the school's mission to develop strong minds and caring hearts. Of course, we actively encourage parents to visit classes to read to the children, to help with special projects, and to share their work experiences with the students. Parents assist in our library as well as during our field experiences, support athletics, and participate with solicitations during the Annual Fund drive. Parents frequently attend our Monday morning meetings to enjoy student presentations, announcements, and celebrations of success. On regular Fridays, parents host "The Coffee Connection," a relaxed time for parents to gather together to meet and greet one another at school. Each fall, the Head of School hosts coffee hours so that new parents can continue to strengthen the partnership. Involvement is expected, and actively engaged parents are one of the greatest assets we have. In the end, the children are the benefactors of the close relationships created throughout the Pine Point experience. These parents assist classroom teachers wherever possible. They hold a special event for their grade within the first two months of school, foster communication and a sense of community at all levels.